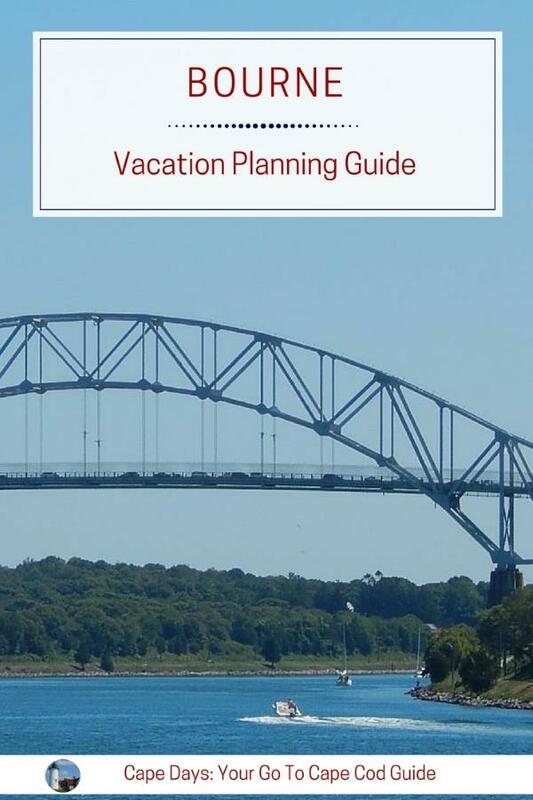 The Best Cape Cod Vacation Town for You? As the town nearest to the "mainland", Bourne MA has the honor of welcoming thousands of visitors each year to Cape Cod. 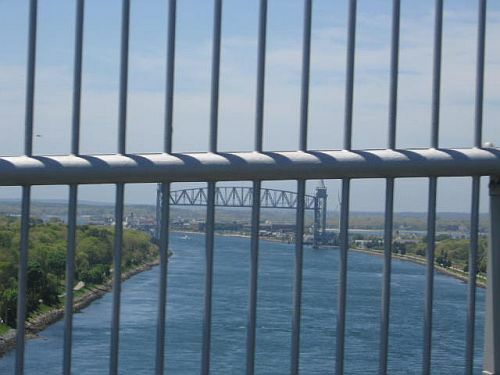 The town of Bourne spans both sides of the Cape Cod Canal. 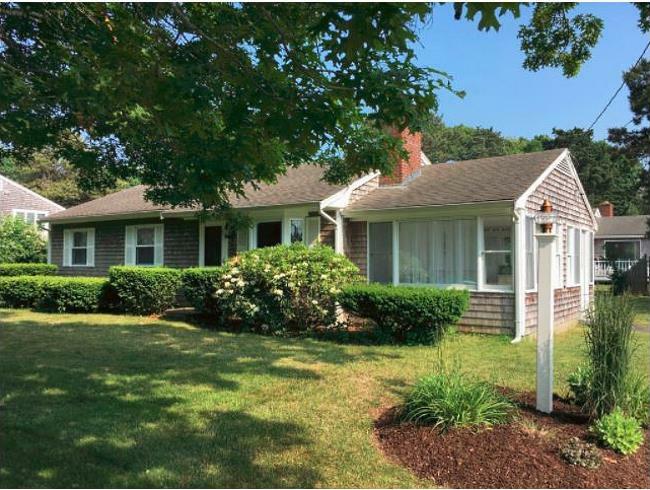 On the north side of the Canal are the more commercialized villages of Buzzards Bay and Bournedale, along with the lovely seaside village of Sagamore Beach. On the south side, the vibe is decidedly more rural in the villages of Gray Gables, Monument Beach, Pocasset and Cataumet. The Canal is that long waterway you see running diagonally across the map, below. I've set the map so you can zoom in [+] and out [-] to view the whole length of the "Big Ditch" and the villages on either side. Bourne has shoreline not only along the Canal, but also on Cape Cod Bay to the east and Buzzards Bay to the west. Bourne is about 235 miles from New York City, and only 60 miles from Boston MA and Providence RI. 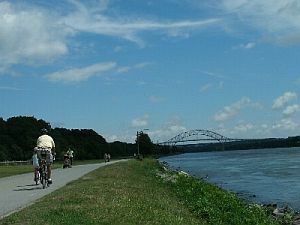 The Cape Cod Canal, the town's "centerpiece", is also the hub of activity in Bourne, all year round. It's the perfect place for walking, biking, and in-line skating. The Canal offers great boating and fishing, too. Plus, birdwatching, picnicing, and breathtaking photo opps. For less active folks, bring your folding chairs and spend an hour or two watching tankers, tugs, cruise ships and pleasure yachts motoring by. 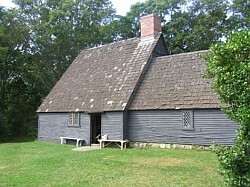 Aptucxet Trading Post (24 Aptucxet Road in Bourne) is the site of the first-known business dealings between the native Wampanoags and the Dutch settlers, dating back to the 1600s. Tours of the Trading Post (a replica of the original), its nature gardens and saltworks, are guided by knowledgable docents who engage children and adults alike in the history of the town and its first European settlers. 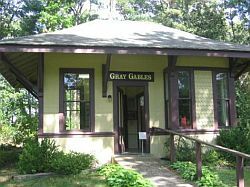 Adjacent to the Trading Post is Gray Gables, the private railroad station of U.S. President Grover Cleveland, who had his "summer White House" in Bourne in the late 1800s. The station houses a nice array of photos and memorabilia of President Cleveland, and the tour guides do an excellent job of bringing the President's days on Cape Cod to life. 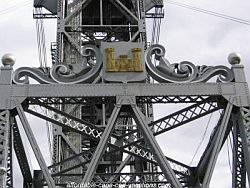 Spanning the entire width of the Cape Cod Canal, the Railroad Bridge is the second-longest vertical lift bridge in the world. This engineering marvel is quite a sight to see, and it's especially fun to be there when the bridge lowers for a train to cross. From late May to early September, you can watch the bridge in operation whenever the CapeFlyer is approaching. A handy parking/viewing spot is at Buzzard's Bay Park on Main Street. In Bourne, as every other town on Cape Cod, some of the most interesting sites are the ones you stumble on while you're walking, biking, or driving around town. 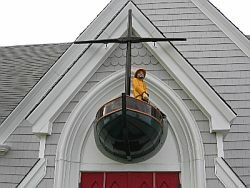 For me, finding this tribute to the patron saint of fishermen was one of those "Wow!" moments. Sorry to say, I can't think of any hotels or motels in the town of Bourne that I'd feel comfortable recommending. If you'd like to check the Bourne hotel and motel offerings out for yourself, here you go. Okay, now we're getting to the good stuff! Click the photo for details about this cottage. Click the photo for details about this luxury home. ... you won't be disappointed with the vacation rental options in the town of Bourne, I'm sure! For those of you who love camping, Bourne has you covered, too! 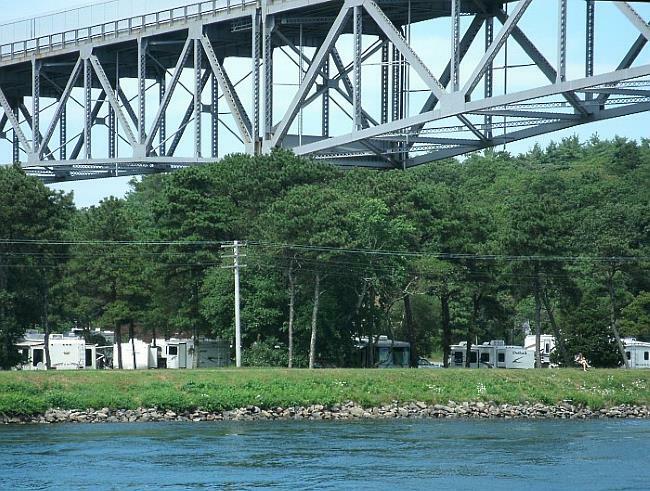 When you make Bourne Scenic Park your camping "home away from home" on the Cape, you'll be just a few steps away from the Cape Cod Canal's scenic views and fun things to do. If your tastes lean more toward a "camp resort", Bay View Campground could be right up your alley. With multiple pools, on-site food and refreshments, fun stuff for the young 'uns, and a dog park for 4-legged campers, Bay View Campground offers it all. 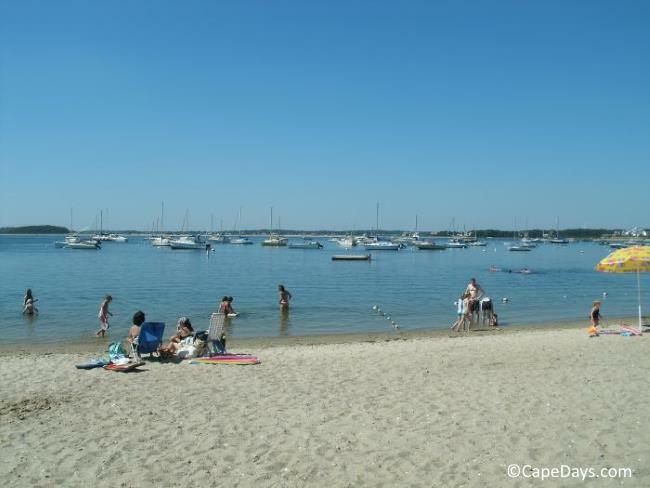 What's the best beach in Bourne for vacationers? Well, that question's not as easy to answer as you might think - thanks to the town's "stingy" parking rules. If you can walk or bike to the beach, then you're welcome to enjoy any public beach in town. But, if you have to drive to the beach ... that's a different story altogether. The good news is: Monument Beach is a great beach with pretty views and warm, calm water. Not a bad option at all! 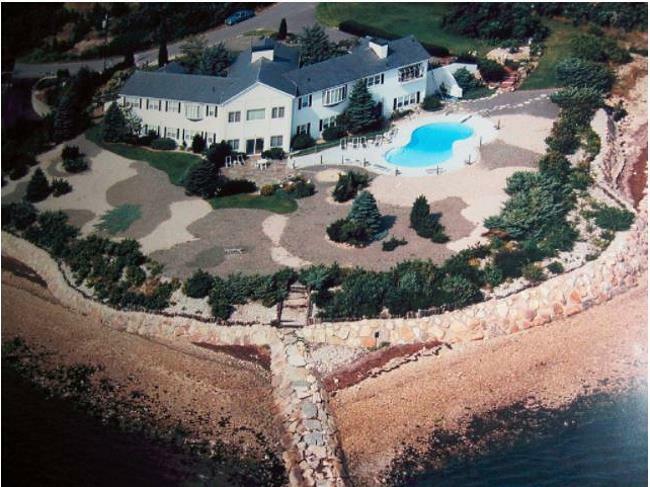 Enjoy your visit to Bourne MA! SAVE THIS INFO ON PINTEREST!